You may substitute our white rice for our delicious house salad. 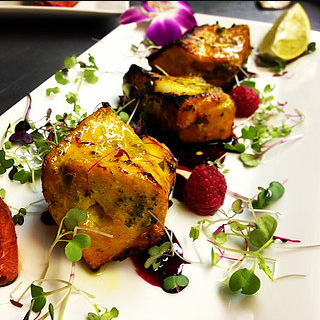 Marinated boneless chicken breast filet, skewered to perfection. Served with ripe grilled tomatoes. jalapeño marinade, skewered and grilled. Wild Caught Chilean Sea Bass Kabob, skewered and grilled. Served with rice. Catch of the day. Ask us for details!